Kyle Grillot - kgrillot@shawmedia.com Chris Sbertoli takes pictures of the Memorial Day vigil at Lake Julian. 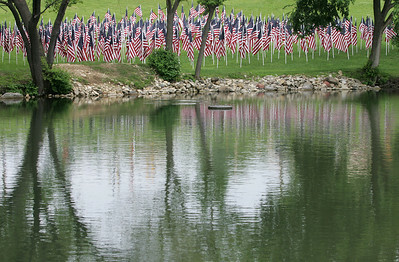 The 48-hour vigil displays 322 American flags representing the 322 soldiers from Illinois who gave their lives during the Iraq and Afghanistan conflicts. 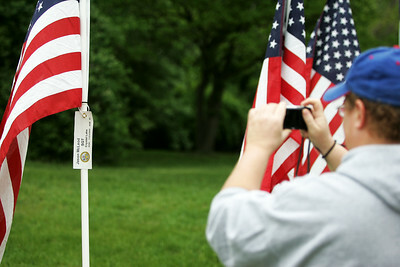 The vigil has been organized by by the Veterans Network Committee of Northern Illinois and will have a closing ceremony on Memorial Day at 6 p.m.
Kyle Grillot - kgrillot@shawmedia.com Jodi Hogrewe takes a picture of Jason McLeod's flag at the Memorial Day vigil at Lake Julian. 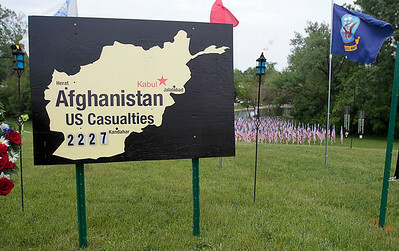 The 48-hour vigil displays 322 American flags representing the 322 soldiers from Illinois who gave their lives during the Iraq and Afghanistan conflicts. 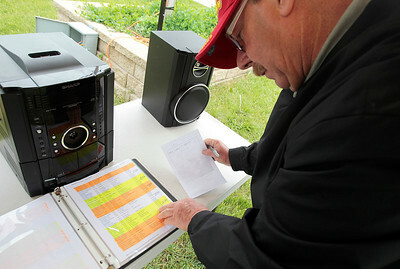 The vigil has been organized by by the Veterans Network Committee of Northern Illinois and will have a closing ceremony on Memorial Day at 6 p.m.
Kyle Grillot - kgrillot@shawmedia.com Veterans Network Committee member Tom Gillis looks through the list of Illinois' deceased at the Memorial Day vigil at Lake Julian. The 48-hour vigil displays 322 American flags representing the 322 soldiers from Illinois who gave their lives during the Iraq and Afghanistan conflicts. The vigil has been organized by by the Veterans Network Committee of Northern Illinois and will have a closing ceremony on Memorial Day at 6 p.m.
Kyle Grillot - kgrillot@shawmedia.com The 322 American flags represent the 322 soldiers from Illinois who gave their lives during the Iraq and Afghanistan conflicts. 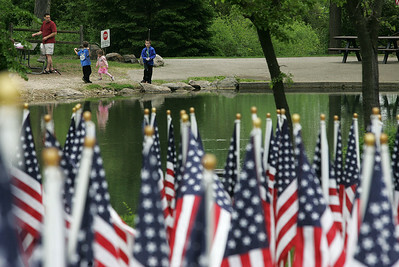 The vigil has been organized by by the Veterans Network Committee of Northern Illinois and will have a closing ceremony on Memorial Day at 6 p.m.
Kyle Grillot - kgrillot@shawmedia.com Ori Schor and his children Omer, 8, Donna, 3, and Yotemm fish across the lake from the Memorial Day vigil at Lake Julian. 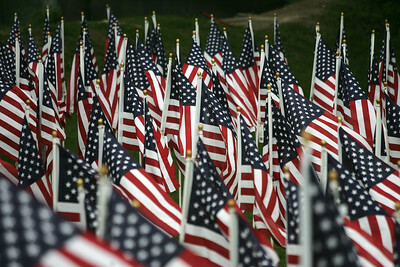 The 48-hour vigil displays 322 American flags representing the 322 soldiers from Illinois who gave their lives during the Iraq and Afghanistan conflicts. The vigil has been organized by by the Veterans Network Committee of Northern Illinois and will have a closing ceremony on Memorial Day at 6 p.m.
Kyle Grillot - kgrillot@shawmedia.com Wreaths, signs, and banners line Northwest Highway at the Memorial Day vigil at Lake Julian. The 48-hour vigil displays 322 American flags representing the 322 soldiers from Illinois who gave their lives during the Iraq and Afghanistan conflicts. 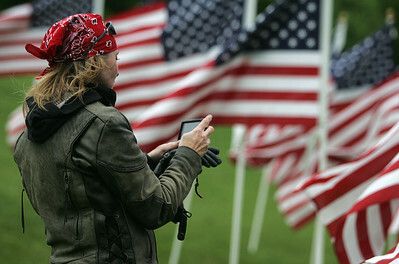 The vigil has been organized by by the Veterans Network Committee of Northern Illinois and will have a closing ceremony on Memorial Day at 6 p.m.
Jodi Hogrewe takes a picture of Jason McLeod's flag at the Memorial Day vigil at Lake Julian. 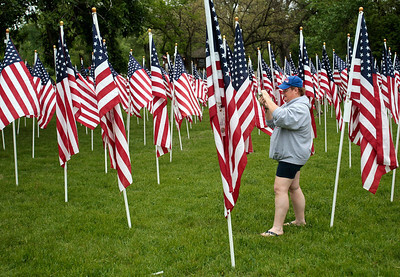 The 48-hour vigil displays 322 American flags representing the 322 soldiers from Illinois who gave their lives during the Iraq and Afghanistan conflicts. 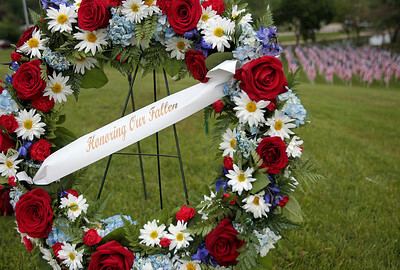 The vigil has been organized by by the Veterans Network Committee of Northern Illinois and will have a closing ceremony on Memorial Day at 6 p.m.